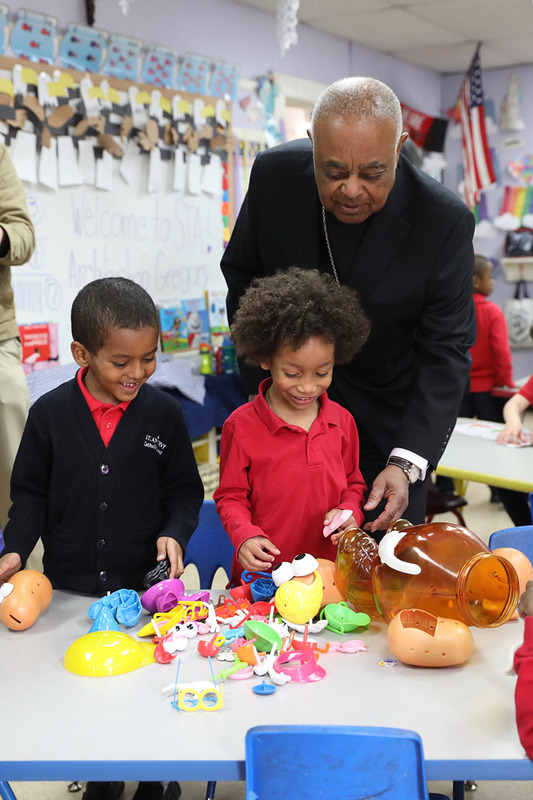 Archbishop Wilton D. Gregory greeted students at St. Anthony Catholic School in Washington during a visit April 5, the day after Pope Francis named him as the new archbishop of Washington. He succeeds Cardinal Donald W. Wuerl, whose resignation was accepted by Pope Francis in October, nearly three years after he turned 75, the mandatory retirement age for bishops. Cardinal Wuerl continued as apostolic administrator until his successor was named. The cardinal headed the Washington Archdiocese from 2006 to 2018. Cardinal Wuerl had faced pressure to resign. “I join all who appreciate his pastoral abilities, his intellectual gifts and his leadership qualities,” he wrote in a statement. Archbishop Gregory has issued pastoral statements on the death penalty, euthanasia and physician-assisted suicide and has published numerous articles discussing liturgy, especially within the African-American community.